Jonathan Schneider conceived of Helix while on vacation in Hawaii, came home and described it to his colleague and friend Larry Atkin and the two of them went to their boss to see if he might buy in on their crazy idea. The rest, as the old saying goes, is history. I started using Helix almost as soon as it first shipped, yet I didn’t really get to know Jon until I’d been involved with Helix for nearly four years. While working on the Helix Tracker project, I spent long stretches of time living in Northbrook, IL, where Odesta was headquartered. I was usually there for six weeks at a time, occasionally longer, over a nearly three-year period. Jon drove down from Whitefish Bay for usually two days and nights a week and we hit if off well enough to spend most of our free time together. Jon was born in Boston, and although he only lived there for the first year of his life, for the rest of his life he would occasionally fancy himself to be a Red Sox fan. Stranger yet is that more often than not, he considered himself a Yankee fan. Odd because he really never lived in New York. But he loved coming to visit family and friends in the east. I was very fortunate to receive one of those visits and consider it to be a memory I cherish on the same level as the foul ball I caught off Mickey Mantle as a very young kid. At the age of one, Jon’s father went to teach at the prestigious London School of Economics and the family went along. At the end of that assignment, they moved to Berkeley, CA where he spent his formative years. The family moved to Chicago when Jon was 11 or 12 and remained there till he grew up. After high school, Jon enrolled at Reed College in Portland, OR. Reed’s freeform academic style appealed to Jon, especially the idea that there were no grades. But sometime during his academic experience there, he discovered that Reed actually did grade kids, they just kept the information to themselves. This gradually ate away at Jon’s relationship with the school to the point where he dropped out. He got a job at Tektronix doing work with missile imaging systems but then his father had a heart attack and he went home to help his mom. When his father got well again, Jon decided not to go back to Portland, to Reed, or to college. He met a professor of Athropology at Northwestern named Donald Sade. Dr. Sade was doing observations of monkeys on an island off the coast of Puerto Rico. Blood was drawn from monkeys in order to determine paternity exclusions. Jon helped him code the data and get it out in a form that was useful to Dr. Sade’s colleagues. In the process, he devised a way to depict geneologies on a computer. When he returned from Puerto Rico, Jon decided he wanted an advanced degree, in spite of not having any kind of degree at all. He somehow managed to talk his way into the graduate statistics program at the University of Chicago. He did manage to get a masters degree, but when it came to getting a doctorate, he stopped short of writing his dissertation and dropped out again, becoming “a guy with a high school diploma and a masters degree.” Just another unique thing about a very unique person. For users of Helix, Jon’s heart lies at the bottom of the icon well. It was this idea of “encapsulation” that brought things into focus for Jon and made him one of the true pioneers of object programming. 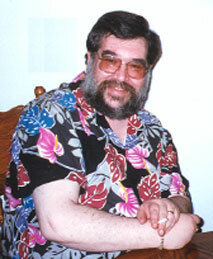 While on a dig in Hawaii with his archaeologist wife, Lynne Goldstein, he got an idea that led to another and another and when he came home, he sat down with Larry Atkin, with whom he was working at the time, and came up with the concept for Helix: an information management tool for people who don’t know how to write code. A visual tool for creating basically whatever you needed to do with your data. Jon loved Lynne. He loved life. He loved opera. He loved food. He smoked Marlboro Lights but knew he probably shouldn’t have, though certainly neither the food nor the Marlboros were his undoing. About a year before his death, he was in a car accident in which one of his lungs had collapsed. He had been going for treatments at the Mayo Clinic and was, in fact, on his way there when he died of something known as aortic dissection. It’s an unrecognized and usually undetectable flaw that results in a blood vessel wall just rupturing. It’s the same sudden death that took the actor John Ritter at the same age as Jon, a scant six years later. Jon Schneider was a man possessed of numerous gifts. One of his greatest he bestowed upon us. As Larry Atkin would say, “Jon would never tell you anything that would get you in trouble.” He had both a wonderful sense of humour and a humorous sense of wonder. His imagination created the incredible legacy we have before us. Special thanks to Lynne Goldstein. We all miss Jon.